Sharp Refinishing Has the Answers to Your Questions Here! This is a "Must Read!" You've got questions. We've got answers. From who we are to what we do is listed below in a question and answer format. But if after reading these questions and answers, you have more questions, we welcome your email (Debbie@SharpRefinishing.com), call (817.305.0300), or chat (see bottom right corner). Bathtub refinishing is also known as bathtub resurfacing, bathtub re-glazing, bathtub re-enameling, and bathtub refurbishing. Regardless of the term used, bathtub refinishing is simply a "sprayed-on" process that can make a worn, damaged bathtub look like new again. This like-new appearance cannot be achieved with Do-It-Yourself products. Only a professional refinisher has access to the high-tech, durable coatings that are required to give a bathtub its shiny new appearance. More importantly, only a seasoned, professional refinisher has the tools and skill to apply the surface correctly the first time, every time. We are a small family-owned-and-operated husband and wife team business, and have been serving the refinishing needs of the Dallas Fort Worth metroplex for almost 40 years - since 1980! In fact, we are the oldest family-owned-and-operated bathtub refinishing and chip repair company in the Dallas Fort Worth area. One of the things that make us different from other refinishing companies is that we are not a franchise. We have a vested interest in our business, and since our last name - Sharp - is also part of our company name, we put it on the line day in and day out. We refinish nearly every day of the week, all year long, and have for almost four decades. Other than this website, most of our business comes from personal referrals. We aren't the cheapest or the most expensive out there, but we are the best in what we do. From the high quality refinishing products that we have located and chosen to use, to the meticulous care we take with every single job, you will never be disappointed with our work. Just take a look at our long list of satisfied customers. In addition to those testimonials, our highly-rated customer reviews at Angie's List has won us their prestigious Super Service Award for 10 years. If you can buy a new bathtub for the same cost as having one refinished, why not just buy a new tub? You can buy a brand new bathtub for as little as $350, but you can't replace it for that same $350. Why? Because houses are built around bathtubs, and the most expensive part of replacing a bathtub is definitely not the cost of the new tub. As a matter of fact, most of the expense of replacement is initially hidden. What are some of these hidden costs? Removal and disposal: Can you physically remove the tub yourself, then get it out of the bathroom or through the front door at all, and if you can, how will you dispose of it? Even if you do get that far, in the process of removing the tub, part of the bathroom tile will surely be torn away, and the hardware for the new tub may not fit the old plumbing fixtures at all. So now you may need to hire a plumber and a tilesetter as well, and on and on it can go. That's how you could easily end up spending thousands of dollars replacing a $350 bathtub, and THAT'S why refinishing is such a great alternative to replacement. To put the 'downtime' into perspective: If we're refinishing your tub on a Monday, you can use the tub that morning before we come out, and then you can use it again on Wednesday morning, so you're really only without the use of the tub for one full day. Will a refinished bathtub look or smell like it has been painted? Ours won't! In fact, it is impossible for an untrained eye to tell the difference between a brand new bathtub and one that has been refinished by us. Regarding the smell, we use a ventilation and filtering system to reduce the fumes that naturally occur with the use of solvents. Although you may notice a slight odor during the spray time or after we are finished, this is typically gone in a few hours. Some people (about 1%) are hypersensitive to smells and may choose to leave the area while the work is being done. What needs to be done before we arrive to refinish? If we're refinishing the bathtub, please have everything removed from the bathroom walls, off the top of the countertops, and from around the bathtub, including the shower curtain (and rod, if it is removable), so Jim will have plenty of room to work and can protect the bathroom from overspray with paper, plastic, and drops. IMPORTANT: If there are shower doors on the tub, they must be removed before we arrive (this is not a service we offer). If we are refinishing a countertop or a sink, the hardware (faucets, handles, and drains) must be removed before we arrive. Also, electricity, a climate-controlled, semi-sterile environment, and access to water are required to do our work. What kind of product do you use to refinish? The reason I'm even listing this question is because so many people ask it when doing their research to determine which refinishing company to hire, and they are asking this question because not all refinishing companies use the same kind of product for refinishing. So which is the best? All we can tell you is that in our almost 40 years experience, we have learned that there are three things that ensure successful refinishing: (1) the type of product used, (2) the foundational preparation, and (3) the skill of the refinisher. We have chosen to use the very best refinishing coating available. It's more expensive than other coatings, but the end result is magnificent in terms of the way the refinished tub looks, cleans, feels, and holds up over time. We thought the above paragraph was more information than just answering the question by saying "The process we use is a two-component urethane, however, it is not an epoxy. Epoxies dry brittle and will 'yellow' over time, but our coating will not. In addition to that, our product has a vinyl base which allows the refinished surface to expand and contract in hot and cold water without cracking out." Can a bathtub be refinished more than once? Yes, a bathtub can be refinished again ... and again, but the existing coating will have to be stripped off ($150) before a new finish can be applied. 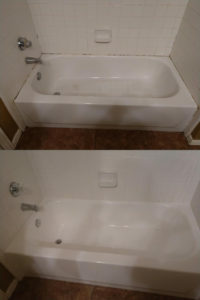 Also, because we will not be able to determine whether there is any damage beneath the existing refinished surface until it's stripped off, we cannot accurately estimate the cost of repairs if damage is found, so we always give a wide range of $25-$150 for repairs in case the tub has to be skinned. We have learned over time that the bottom of older cast iron tubs (vs. steel-based tubs) develops pinholes that can't be seen with the naked eye. However, when we begin to spray on the finish, these pinholes and flaws begin to appear. Skinning (filling in holes and worn areas with bondo to help build up the surface that has worn off) the tub during the prep phase helps eliminate this problem. 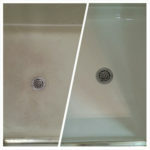 Can you repair chips, nicks, scratches, and cracks from bathtubs or sinks without having to refinish them afterward? Yes! We've been doing chip repair for homebuilders and homeowners across the Dallas/Fort Worth metroplex for many years. From hammers dropping into the tub, to soap dishes and towel bars falling off the wall, chips can happen in homes under construction, in homes just built, and in homes lived in for years! The good news is, just because a tub or sink has chips, nicks, or scratches, it doesn't necessarily mean it has to be completely refinished. If the damage is located above the water line, it can be repaired without being refinished afterward. However, if the damage is located below the water line, the entire fixture must be refinished after the repair in order to seal it and guarantee the work. That's because there are exposed edges surrounding the repair that are susceptible to lifting when under water, causing it to eventually loosen and float away. In cases like this, we recommend refinishing so the repair can be sealed and the work guaranteed. There is a $125 minimum charge for chip repair. Please note that our warranty is specifically related to the two things under our control: workmanship and product defects. We do not guarantee that rust, cracks, or holes won't reappear later in a bathtub, sink, shower, or shower floor if the underlying source of the damage (possibly a house shift, improper initial installation, water leak, or previous damage to the same area) has not been corrected. Can you refinish tubs and sinks that are not yet installed? No. We do not have a refinishing facility. All of our work is done in the customer's home, and because we need electricity and water for the prep, and a semi-sterile, climate-controlled environment to do the work, we cannot refinish items outside or in a garage. How long should a refinished bathtub last? At what point should refinishing work be scheduled? Contrary to popular belief, if any other remodeling work (tiling, painting, flooring) is going to be done in the bathroom where the refinishing is to take place, we prefer to be the last ones in - after all the other work is finished. Why? Because we know how to protect what's already there, and we won't damage someone else's work. Experience has taught us that other workers, unfortunately, are not as careful as we are. And accidents happen. 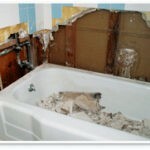 If plumbers or tile setters come in after us, they may drop a tool in the tub or otherwise damage our work. 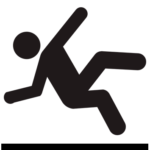 We will be able to fix the damage, but our minimum repair charges ($125) will then apply, no matter how soon after refinishing the damage occurs. A professionally refinished surface looks, feels, and cleans like brand new, so check your cleaning product labels to be sure you're using only mild, non-abrasive products without bleach. Always use a non-abrasive sponge or damp cloth when cleaning because as with any new surface, the finish or shine can be dulled or damaged by abrasive applicators. Most liquid and foam 'green' cleaners will work, but read the label to make sure they do not contain bleach or abrasives. We recommend Simple Green Ready to Use, or even a wet soapy washcloth. In any case, be sure to thoroughly rinse away your cleaning solution. For optimal results, maintain a non-silicone caulking around all refinished surfaces, especially bathtubs. We recommend Loctite's Polyseamseal Ultra (found at Lowe's), or DAP's Kwik Seal caulk (found at Home Depot). Do not set or leave items like soapy bottles, washcloths, or bar soap on bathtub or sink ledges because it can cause moisture build-up between those items and the refinished surface, which can lead to peeling, and void your warranty. Use a shower caddy in the bath area instead. Do not allow metal or hard plastic toys in the tub, as they can deeply scrape and even break the refinishing seal. Do not bathe animals in the tub, as their claws could breach the surface. Do not let a leaky faucet go unrepaired. Even infrequent dripping water can eventually cause surface bubbling and peeling. Do not use any kind of hair dye, colored bath oils/powders, or shower gels in the bathtub or sink. If you ever use a mat in a refinished bathtub, do not leave it in the bathtub. You must remove it after each use to avoid moisture build-up between the mat and the tub, which can lead to peeling and void your warranty. We warranty our refinishing work for 3 years against bubbling and peeling due to workmanship or product defects. If there is a problem with the product itself or the workmanship (application of the product), it will show up within a week of refinishing, and it is very rare. Bubbling or peeling due to chipping: A refinished surface can chip just like a non-refinished surface, so if your refinished surface does get chipped (from dropping something in the tub, for example), keep the area as dry as possible and contact us to schedule a repair (a $125 minimum repair charge will apply). Timing is especially important if the chip is located below the waterline, because water can eventually work its way beneath the refinished surface and cause the refinished surface to bubble and peel. Bubbling or peeling due to moisture entrapment: Setting and leaving items like wet or soapy bottles, jars, washcloths, or bar soap on a refinished surface can cause moisture to get trapped between these items and the refinished surface, causing it to bubble and then peel when picking up the item. We recommend using a shower caddy or soap dish in the bath area to avoid this. Bubbling or peeling due to unrepaired leaks: Even infrequent dripping water on a refinished surface, especially near the drain, may cause it to eventually bubble and finally start to peel. Don't let a leaky faucet go un-repaired. Please note that our warranty is specifically related to the two things under our control: workmanship and product defects. We can not guarantee rust, cracks, or holes won't reappear in the future if the underlying source of the damage (possibly a house shift or improper installation) has not been corrected. What types of fixtures and surfaces can be refinished? Can you refinish shower pans/floors? There are times when the walls of your shower still look good, but the floor you stand on looks really bad. That's no problem, because we can refinish just the shower floor without having to refinish the shower walls. Please note we do not refinish tiled shower floors. Why? It's the nature of a shower pan to hold moisture, and that moisture can work its way up through the grout lines and eventually cause the surface to bubble and peel. When sending pictures of your shower floor, please include measurements, which usually range from 3x3 to 3x5. What about dirty-looking tile surrounding a bathtub? Refinishing vs. Deep Cleaning: If you want to change the color of the tiles surrounding your bathtub, refinishing is what you want. However, if the tiles just look extremely dirty, especially around the grout lines, it doesn't necessarily mean that the tiles need to be refinished - it may only need a really deep clean! First, check the walls themselves. If they still have integrity (meaning no loose tiles, no obvious water damage, evidenced by no "spongy" feel to the tiles when you press on them, and the grout is still firmly in place), we can deep clean them to make the entire surround look really clean again (this is not an ordinary type of clean that you can or would do). So ask us about this option. The cost to deep clean a standard 50sf surround (3 walls of tile that are 5 feet high) is $150. What colors are there to choose from? Our pricing is based on a white or off-white finish, but if you want another color, choose from our solid color finishes, as we can special order ($75) our refinishing process in any of these colors. Please note we do not refinish in dark colors. Why? Because even in the semi-sterile environment we try to achieve, there are still minute dust particles that float through the air that are easily seen on a dark surface. If you don't need a special order color and are just trying to match the color to an existing toilet or countertop that is some variation of white or off-white, Jim has a great eye for color, and can tint the pure white color he starts off with to closely match the white or off-white color you already have. For bathroom and kitchen countertops, we offer the hugely popular MultiSpec colors, which give the appearance of granite and stone. Is there any plumbing work involved during refinishing? On all bathtubs before refinishing, we prefer to remove the drain and overflow cover so that we can get a complete surface to spray. That's why we ask the homeowner to make sure the existing drain can be removed long before the scheduled refinishing appointment, which will ensure it can indeed be removed by us when we get there to refinish. Another reason to make sure the drain is removable is that you may discover you have a leak or some other issue that will need to be fixed before the tub can be refinished. How do you do remove the drain? Look down the hole where the water goes out - you'll see a crossbar. Either use a drain puller (available from Home Depot for about $10) or get some pliers to unscrew the crossbar (counter-clockwise, like you would a jar lid). The entire drain with the little silver ring (not the plumbing beneath the drain) will lift out. You may have to use some muscle to loosen it - it might even break if it's been in there for more than 40 years, but you'll want to know that beforehand so it can be fixed long before we arrive to refinish. If you do not want to risk breaking the drain when trying to remove it, we have a $50 workaround for that (installing a fully-functioning drain that covers the existing drain). In any case, because your bathtub is going to look brand new after being refinished, you will definitely want to replace an old dingy and scratched drain and overflow cover with a brand new shiny set. Before bathroom sinks, countertops, and oversized cultured marble/acrylic bathtubs can be refinished, the plumbing fixtures (spout, handles, and drain) must be removed. Why? Because these items are sitting on the surface that will be refinished and it's impossible to refinish the surface properly with them still in place. Since we do not have the plumber's tools or expertise to do this type of work, you may choose to do this work yourself or use your own plumber. Also, if you have shower doors on your bathtub, you will need to have them removed before refinishing. 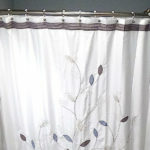 Because there are so many different types of shower doors and we do not have the expertise to provide this service, you may choose to do this work yourself or hire a handyman to do it. A newly refinished tub is going to look, clean, and feel like a brand new tub, which means it is going to feel slicker than what you've been used to. Because of this, you must exercise some caution when stepping into the tub. We're not saying it is overly-slippery. We're only pointing out that it will be more slippery for a few weeks than before it was refinished. 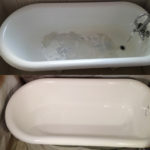 Having said that, you may want to opt for adding an anti-slip treatment ($75) to the tub bottom the day of refinishing. As the word 'treatment' suggests, this is not a traditional glue-down mat. It is an anti-slip surface that is applied to the tub bottom between the primer and top coats. It can be detected visually at certain angles depending on the light, but is basically barely noticeable. If your tub has never been refinished and you're looking for an anti-slip solution, we can apply a treatment to the tub bottom that you cannot feel or see until it gets wet - then you will feel the grip of the anti-slip surface. Cost is $175 for this service. Part of the preparation before refinishing a bathtub includes (1) cleaning and/or trimming the caulk line between the tub and last row of tile, (2) protecting the immediate surrounding area with paper and statically-charged plastic, and (3) removing the drain and overflow cover in order to get a complete surface to spray. The day after refinishing, you have the option of removing this plastic/paper, re-caulking the tub, and re-installing a new or the existing drain and overflow cover ... or we can return the next day to do these things for a return trip charge of $95. Most homeowners can do these 3 things, but generally still prefer that we do it so it is a turnkey project for them. It's totally up to you, but for scheduling purposes, we will need to know if you want the Turnkey Service, as it does require an extra day in our schedule. Regarding the drain and overflow cover, if your existing set is dingy and old-looking, you will want a shiny, new set for your shiny, new bathtub. If you choose the Turnkey Service, you can purchase the set yourself that you want us to install, or we can buy it for you. If you want us to buy it, the cost of the drain and overflow is determined by the type of finish you choose (chrome, brass, brushed nickel, oil rubbed bronze, etc.). The most common finish is chrome, which is $50 for the drain and overflow cover set. All other finishes are $75 per set. YES! The quickest and easiest way to get an estimate is to take a picture of the items you want refinished, and then send them to us via email to Debbie@SharpRefinishing.com. 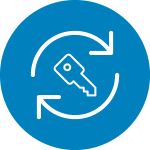 Using technology in this way helps us to quickly create your bid because it eliminates an extra trip for assessment, which in turn saves time in you receiving a bid and scheduling the work. Because we require a paper trail of all our communication, we do not use a cell phone number for you to text pictures to - they will need to be emailed. 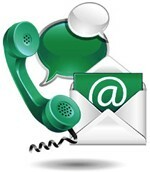 When emailing for an estimate, please include your zip code and how quickly you need the work to be completed. Which kinds of payment methods do you offer? 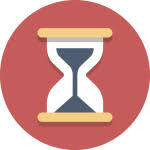 No money is due until the work is completed, but payment is due and payable at that time. Checks can be made payable to Jim Sharp or Sharp Refinishing. We always provide you with a PAID invoice by email after the work is completed and payment has been made. Please note we are a small family business, and we do not accept credit cards nor extend payment terms. 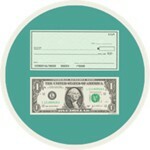 Our only accepted method of payment is by personal check or cash, due at time of service. By email (Debbie@SharpRefinishing.com) phone (817.305.0300), or chat here on the website (bottom right corner of your screen). We personally answer all of our emails and telephone calls, but if you do happen to reach the message center between the hours of 10am-5pm, it means we are on the other line with another customer or are temporarily away from the office. Please leave a message, because we will call you back in a timely manner! Meanwhile, if you're just looking for a quick estimate, go to our Quick Bid page to answer a few simple questions that will get the process going. Have you/will you train others on how to start a Bathtub Refinishing business? Yes, we have and we will, as long as you are located no where near the Dallas/Fort Worth metroplex. 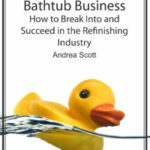 We are featured as a professional trainer in Andrea Scott's 'tell all' book entitled "Staying Afloat in the Bathtub Business - How to Break Into and Succeed in the Refinishing Industry" (click here to view or purchase on Amazon). Our 2-week training is extensive, intensive, and thorough in every way. You will go with Jim every day on jobs so that he can teach you absolutely everything there is to know about refinishing - but most importantly, how to do it right the first time, every time. He is meticulous - no shortcuts - and that's why we've been in business for so long. You will have the opportunity to see him refinish bathtubs, countertops, showers, etc. What we've done in the past is when we know what dates we'll be training, we set jobs up so that we have the maximum amount of variety. Usually during week two, you will start to spray. Not only will Jim show you how to do the work, he will also show you how to deal with customers. Jim is a very gentle soul, and people just love him. It makes a difference, and we get many, many referrals because of how he treats our customers. Office-wise, I will show you how we do business, from having a website to bidding jobs over the phone to follow-up, which includes our documentation for sending estimates by email, confirming jobs a week before, and thanking customers after the job. We are a well-oiled team and love what we do. We'll do everything we can to teach you to do and be the same. Part of the $5000 fee includes acquiring a list of all our suppliers that we have found and chosen to use over the past 40 years, which in itself is priceless. We started our energy business way back in 2005, and it is one we continually build by saving people money on their energy bills. It's also a great way to make residual income on a part-time basis, since now that energy has been deregulated, anyone can financially profit from it. And of course, the most important thing in our lives is sharing our love for Christ and pointing others to him for eternal salvation. If you haven't received that free gift from God, click on the cross to read how. If you have any questions, please let us know! Although we have high-quality work ethics and skills, what drives our excellence is Who we're ultimately serving. Colossians 3:23: "Put your heart and soul into every activity you do, as though you are doing it for the Lord Himself and not merely for others." We're working for the Lord and not for man. It's important and drives our every decision in life.